Postural Orthostatic Tachycardia (POTS) is a very common condition we see at the Hansa Center for Optimum Health in Wichita, Kansas. Because it is so common, we have developed many ways to address POTS naturally, that often enables permanent correction without the use of pharmaceutical drugs. In this article, I present the causes and the solutions. With our innovative approach, we are very close to 100% success in eliminating POTS...without using any medications! According to Dysautonomia International, POTS includes a wide range of symptoms. The many brain, heart and circulatory problems seen in POTS can be caused by Lyme Endocarditis as a result of metabolic toxins produced by the spirochetes (bacteria) of Lyme. The primary toxin identified through clinical research is the accumulation of ammonia (NH3) in the heart, brain, and other infected tissues. Phonocardiology, when used in tandem with the powerful testing ability of BioResonance Scanning™ is a system of treatment now called NeuroCardial Synchronization™(NCS). Since NCS is such a new innovation, a Google search will likely not get any hits on the topic. Due to the fact that NCS was developed at the Hansa Center, and we are not a training/teaching facility, but a treating facility, NCS is only available at the Hansa Center for Optimum Health, in Wichita, Kansas at this time. There are plans to train other doctors in future. At the base of your skull sits the cerebellum. The cerebellum is the primary neurological component that helps us sense our position. One of the simple tests you can do at home is to stand on one foot with your eyes closed. If you immediately begin dancing around, trying to stand straight, you have a cerebellum issue. You might want someone to stand close to catch you if you start falling over. If you do start swaying or falling over the cerebellum needs to be addressed. Treating this condition that is present in almost 100% of POTS sufferers, is most often very easy with our systems of treatment. Another test for cerebellum issues is to stand with your feet together, eyes closed, with your arms out stretched to the sides, pointing your index finger. With your eyes closed, touch the tip of one index finger to the tip of your nose. If you miss the tip, or are having to hunt around to find it, you have a cerebellum issue. If you touch the tip of your nose with one hand then keep your eyes closed and touch it with the tip of the index finger of the other hand. To make it harder, use the tip of your pinky finger to the nose. Vertigo and dizziness are often corrected when these cerebellum issues are addressed. Some POTS people feel they are sinking through the bed when they lay down, or the floor or ground is swallowing them up. This is often resolved with various corrections of the cerebellum, inner ear, cerebrum, falx tentorium and falx cerebri, as well as all of the multi-posture/intraoral jammed cranial bones. It sounds like a lot of issues to treat, but these can often be addressed using non-pharmaceutical corrections, sequentially over a course of days. The fibrous floor that the brain sits on inside your skull is called the Falx Tentorium. The Falx Cerebri is a fibrous wall that separates the right and left hemispheres of your cerebrum. 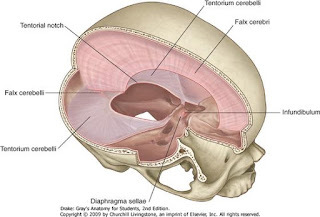 In any type of head injury or even when you fall, or have been in a whiplash type accident, the Falx Tentorium and the Falx Cerebri can get shifted out of their normal position inside the skull. 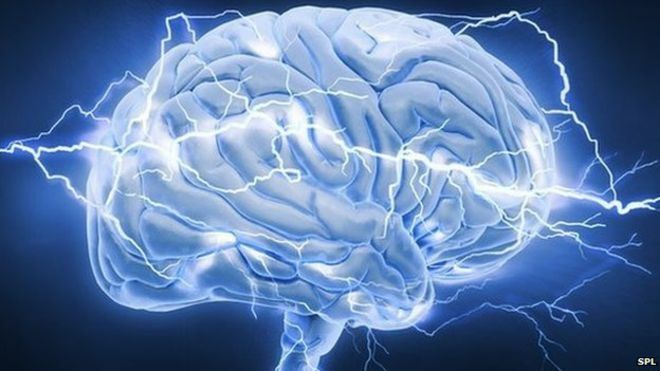 This shift causes what for all intents and purposes might be seen as an electrical short-circuit in the brain with every breath you take! Imagine, if the brain runs everything with the heart, how bad is it to short-circuit with each breath? Believe it or not, one side of the nose breathes in only positively-charged ions from the air, while the other side breathes in negatively-charged ions, both of which feed the brain and body with a ratio of ions as needed by whatever internal and external challenges are going on. A person generally takes a breath 16 times a minute. That is 960 times an hour, 23,040 breaths a day! So literally every organ, gland, and muscle goes momentarily weak 23,040 times a day. I am going to teach you to test this at home. You will a friend or family member to help you do this test. Lay on your back with your arm out held perpendicular to your body, with your elbow locked straight, and your thumb point toward the feet. Have the person helping you gently grab your arm just below the wrist. Have them tell you to "hold strong" as they gently pull your arm slightly towards your feet. They should just be pulling hard enough to see if your arm muscle immediately locks strong. Obviously they can put all of their strength into it an beat your ability to resist their pulling, but that is not the point. You want to feel what a strong muscle should feel like. The muscle should immediate feel strong right away and not be gushy, like the stretching of a rubber band. Now that you have established what the strong muscle feels like, have the person helping you reach over with their finger and push on nostril closed. With that nostril closed, breathe deeply through the other side of your nose that is still open. As you do so, have the person immediately retest the arm strength. If it goes weak and gushy, you have a shifted Falx. Now test with the other side of the nose close and test the arm for a weakening. Any weakness on either side indicates a dislocation of the Falx Cerebi. Now do the arm strength test again with both nostrils closed and breathing deeply through your mouth. If the strong muscle goes weak, then you have a dislocation of the Falx Tentorium. In actuality, you can't have one without the other, but it matters to a doctor when it comes down to correcting the problem. Correcting this condition is a simple matter that can only be done by a doctor trained in multi-posture/intra-oral cranial/spinal percussion. This technique is like Cranial/Sacral therapy on steroids! There are some treatments and therapies that lead up to this correction that help maintain its correction position once it is corrected, but the actual correction often takes about an hour. Again, this is a huge problem in POTS, whose correction cannot be done with a drug! Within the cells of your body are little "organelles" like small organs that are called mitochondria. These are the energy factories that produce ATP (Adenosine Triphosphate). You burn 40% of your total body weight in ATP every day! If you weigh 100 pounds then 40 pounds of ATP is made and used up for energy to run your brain, your muscles, your organs, your biochemistry, your everything! Thankfully your body recycles it, otherwise you would waste away to nothing, which is often why when you are bed-bound, you lose weight and strength. To make energy from ATP your body breaks one of the three phosphate groups off of the three phosphates attached to the adenosine molecule and as that phosphate breaks off...one photon of light is released, as well as heat is released. So in essence, your body is fueled by light and heat! The heart is the primary generator of electromagnetic energy in the body, generating over 5000x stronger energy than the entire nervous system. Because the heart has many muscle fibers and they are always working, each heart muscle fiber needs many energy factories...mitochondria. A heart muscle fiber has approximately 2000 mitochondria in each cell! When a person is bed-ridden, muscle atrophy sets in. Essentially when we are sedentary, never exercising, the body says, if you are not going to ask me for more energy, I am going to start shutting down all these energy factories that are not needed. So the muscles get smaller. You still have the same number of muscle fibers, but way less mitochondria. The same is true when you work out. The body goes, wow, if you are going to keep asking me for more energy than usual, I am going to have to create more energy factories...mitochondria. After awhile, the muscle fibers swell up, loaded with mitochondria and the available strength and energy rises. To test your mitochondria at home, you will need someone to help you. Lay on your back or sit with your arm out perpendicular to the body, with the elbow locked, and palm open with your thumb pointing to the feet. Have the person helping you pull gently to see the muscle lock strongly against the pull. Now have the person pull gently ten times. If there is a deficit in mitochondrial numbers and a problem with the biochemical energy metabolic pathways, the muscle will go weak within the first few pulls. Good mitochondrial function should enable you to maintain strength, without your arm muscle feeling gushy or like a stretched rubber band, for the full ten pulls. Mitochondrial issues are caused by inactivity, but also by messed up biochemical pathways. Our doctors have ways to test these situations and correct them often, with the ability to sustain this arm muscle strength to ten pulls within a few days of treatments. All without pharmaceuticals, just through working to naturally restore the body's correct structural and functional integrity. It goes without saying that all of the things we have already discussed necessarily cause alterations in hormones, neurotransmitters, and every other biochemical issue you can name. Simply correcting the above issues can enable the body to regain the correct regulation of your body's biochemistry, however while you have been sick, various biochemical processes likely have been damaged, blocked, or otherwise dysregulated by opportunistic infections, the accumulation of toxic cellular junk in the lymphatics from having to lay in bed for months to years. The body's chemistry responds to the challenges you place on it. If you are exercising in a gym, your biochemistry will shift to cranking up the hormones and neurotransmitters and such needed for your body to perform the exercises. If you are eating dinner, your body will send more energy to the digestive system's biochemistry to digest the food. If you just lay in bed for months, you can't be surprised that certain biochemical pathways haven't been used and are sluggish to get busy again. If you are depressed everyday, every cell and tissue in your body shifts it's biochemical output to support the sluggishness associated with a depressed state of mind. The same holds true for anxiety or any other emotional state, including genuine love, appreciation, and joy, which all cause an entirely different set of cell and tissue biochemistry that happens to positively support healing! Treatment of all of the biochemistry is made much easier by the testing and treatment innovation called BioResonance Scanning (BRS), another technology developed at the Hansa Center. BRS enables an adjunctive way to test all of the steps in the primary biochemical pathways involved in POTS to identify where the various steps in the biochemical sequences are blocked. When a pathway is blocked it is easy for someone to tell when they take the right nutrition but their symptoms get worse. The nutrient itself is pushing a blocked pathway! BRS can help the doctor quickly identify the blockage and immediately test for the correction the body needs to open up that blocked area. Yes, this too is done WITHOUT pharmaceuticals. Yes I have an attitude when it comes to pharmaceutical treatments, because they just treat the symptoms instead of enabling the body to do the work itself, and very often the drugs start causing the same or worse issues. Great insurance pays for it, but nothing is fixed ever unless the body's own ability to get back to work is corrected. Better to me is to get back to normal life where you are not having to take something to feel good...you just feel good and you are able to work, exercise, rejoin life in its fullest! Think about it. Most people led a relatively normal life before being diagnosed with POTS. If you had essentially a normal life before POTS then your body functioned fairly good in spite of any SNP mutations you inherited from your parents. If you have always been sick or if you were not sick prior to POTS, it can be beneficial to understand the role genetic/epigenetic predispositions play in your present state of health. 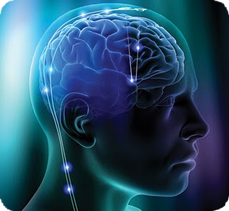 Again, our doctors are able to assess and often help the body correct these predispositions using another innovation developed at the Hansa Center, called Fractal Frequency Modulation. We have seen dramatic improvements in some of the toughest cases by getting to the deepest parts of the body's regulation of metabolism. I hope you see that POTS is way more than a salt deficit, or an adrenal issue, or whatever you have been told, and that even though pharmaceuticals can help the symptoms, they are not correcting the body's issues. POTS is not just one thing, nor is it just the things I have discussed here. We could go on and talk about organ-circuit problems, but that would make for a much longer article. There are many more issues I could discuss that feed into POTS, but this is a good start. Each person's case is a different collection of problems that must be addressed individually. I have given you easy ways to test that can help you diagnose yourself at home, even if you don't have a diagnosis of POTS. Unfortunately the treatments and corrections are not something that I can tell you to just go to the health food store or vitamin shop and take x.y, z supplements to correct. I want to scream sometimes when I hear that young people, or old for that matter, have lost months and years of their life to something that can often be corrected fairly quickly if only their doctors would be open to learning more than drug therapy. Even on the natural side of things, taking fist fulls of supplements is often doomed to fail because supplements cannot fix many of these core issues! If you are suffering, we are here to help you. For over 24 years the Hansa Center for Optimum Health, in Wichita, Kansas has specialized in the restoration of health for people with previously unresponsive and chronic illnesses of virtually all types. Over 85% of people come from other states and countries. If you have done everything you and your doctor know to do and are still struggling, contact our wonderful Patient Care Coordinator, Kara, at patientcare@hansacenter.com, for information on the exciting new treatments we have developed at the Hansa Center for Optimum Health. For additional info, visit our website at www.HansaCenter.com. All of our doctors are proudly, Doctors of Chiropractic Medicine, with post-graduate training in Advanced Biological and Bioregulatory Medicine, as well as Anthroposophical Medicine. Our training does not require us to depend upon pharmaceutical drug-induced illusions of health, the suppression of symptoms, nor do we have to unlearn what we have been taught as do conventional medical physicians. What is only natural in our training and profession, to work to restore the optimum structure and function of every aspect of the body as a way to help the body eliminate disease, is only in recent years that mainstream medical doctors have begun to accept and learn the concepts of functional medicine and now proclaim it as self-evident and truly science based. *Due to the exhaustive time spent per day with each patient, and poor repayment history of insurance companies, we unfortunately cannot accept insurance assignment. We do participate in Care Credit, and accept all major credit cards. Please call 316-686-5900 ext. 1, for current pricing for our economically-priced, All-inclusive 2-3 weeks intensive packages of care.